Where is the "fun" function? It's been awhile since I've bothered posting. A few things are keeping me busy. These things happen to include the Nintendo DS games Phoenix Wright: Ace Attorney, Justice For All and Puzzle Quest, which are both fairly brilliant in their own distinct ways. As far as my game designs go, I've been working on a solitaire zombie game for my games-on-the-cheap list called One Against the Dead, and a game called Sir Reginald's Fabulous Country Estate which will hopefully neatly all tie in with the rest of this article. There always seems to be some kind of running discussions on BGDF regarding various game design theories and paradigms (as can be seen here or here, for example). They are somewhat interesting from a scholarly viewpoint, and they usually wind up including big fancy words of importance when, in my mind, there are really only a few things that are really important. Ultimately, a game is a simply a product; and how well (or how poor) the product turns out depends on how well the goals of the product is met. Games pretty much have only one real goal: fun. Granted, they may have some other goals as well, things such as "simulation" (trying to accurately re-create an experience that one may not normally be able to do), or "educational" (trying to teach a specific skill or ability). But ultimately, fun is the usual target. A game that generally isn't fun is a game that won't get played. But fun is sort of a nebulous goal, in addition to being a very personal thing. While most people could agree on if a game meets an educational target ("this game does a good job of teaching kids on how to count change"), or simulation ("this game accurately reflects General McBean's ill-fated attack on General Lee's non-existent forces in North Dakota with lightsabers"), each person grasps at fun with very different sized hands. And those hands can change size depending on the type of game being played. Producing any type of game in a corporate environment really brings out the ghostliness of fun. "Where's my time to make it fun?" It should be noted that this isn't meant to pick on anyone of my former employer; this is just how it works when you have a system that requires deadlines because mouths need to be fed. And you can't feed the mouths without product coming off the factory line. And that doesn't happen unless the bill of materials was solidified 3 months prior in order to shop around for parts. These are all the tangible things, with known prices to them, that you can throw in the a spreadsheet, and perform mathematical equations on to get desired results. However, fun is simply magic. 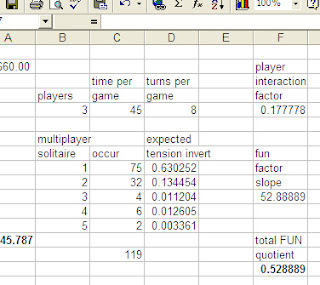 If you could somehow create an excel function that would guarantee fun all the time, you'd be the richest person on earth. You can put together a list, or form a path, that you think may guide you down the right path. Or conversely, create a list of "things to avoid" and try to find fun by deletion of ugly elements. These are things the that usually go on in the usual BGDF forums. Things like "what is you path to making a game?" or "Do you work on theme or mechanics first?" But still, if you create a product that includes your desired features, that doesn't mean it's fun. It means you have a thing that does your list of features. You've created a cellphone. It doesn't mean that the features don't work or aren't useful. It's just that you aren't playing with it because it's fun; it's because it works. But no one really has a slip of a paper that they can pull out of their back pocket with the"magic rule that makes a game fun." It's completely an iterative, "try it once, make changes, did it work," kind of thing. Which could take hours. Or years. Or depending on the other goals, never. At which point maybe the goals should change. Anyway, I guess where I'm leading towards is this; when starting a project, I think it's also worthwhile noting of what you think would make it fun. Games should be mostly about providing an entertaining way of passing the time. Some thought should be made at the very beginning as to WHY it should be entertaining. Of course, this will mean different things to different people. But simply saying "because it takes place in the Lord of the Rings universe" or "it's a pick up and deliver game" doesn't make it fun. Lord of the Rings Checkers, anyone? Which leads me into Sir Reginald's Fabulous Country Estate. This game is inspired by my previous rant against Pillars of the Earth. To sum it up, while I haven't played the game, I've seen pictures of it and thought that whole "build the wooden cathedral" thing in th middle of the board looked really cool. But then I glanced over the rules, and realized that the cathedral is simply a round marker; at th end of a round, add a wood piece to the cathedral. Once all the pieces are placed, the game is over. Lame. There's no sense of a reason why you should build the Cathedral differently from one time to the next. You can place all the pieces in a random puddle of wood in the middle of the table and the game doesn't care. Or a wacky Jenga-like structure. It doesn't matter. I was wondering how you could build something with wooden bits, where the actual building of it meant something important to the game. Some thoughts floated around for a while, back-burnered in my head. I had some discussions about it with Sedjtroll in the BGDF chat room, but never really intending to work on it. Then Xaqery donated 200 3/4inch cubes to me to do anything. And so, with a bagful of cubes, and some light prodding by Sedj, I was off. Ultimately, playing Sir Reginald is a lot like being a real estate agent, trying to sell a home to a picky future homeowner. He has a lot of wishes for what he wants, but every estate can't fulfill every wish, so he'll buy the one that best suits the most number of his wishes. And the agent can influence his wishes a bit, getting him to change his mind on some things. The main aspect of this game is that every player is building a Manor, Guest House, and Servant's Quarters on a Plot of Land using the cubes, which come in various flavors, such as Doors and Windows. Sir Reginald has a list of things he wants in his house as depicted on cards. The player who best matches the cards with their buildings win. It's fairly straight-forward. But what caught me a little off-guard is how much fun it is to build little mansions with the cubes. It's a very tactile, rewarding experience just to build things, without a game wrapped around it. It's a toy as much as it's a game. And unlike Alhambra, where you don't really get the feeling of building a palace (even though I like the game a lot, it could just as easily lose the theme and be an abstract), Sir Reginald really does feel like you are building houses. For some reason, I always place my doors facing the road, and most of my windows overlooking the lake, because, well, that's what you'd expect in real life. It's fun just playing with the cubes and building things. Therefore, almost all of the rules, or lack thereof, are focused solely on making the building of stuff the focus of the game. Every turn you collect cubes, and you build with them. That's pretty much it in a nutshell. For example, I played around with only drawing one cube and placing it on your turn. That wasn't as much fun as placing multiple cubes. So the rules focus on placing 3 cubes per turn. And while Sedjtroll gently kept prodding me to try and come up with a more interesting way of collecting cubes, suggesting various routes through hiring craftsmen, getting the proper supplies, that kind of thing, I decided against it. While these are fine ideas, these really took the focus away from the simple fun of building things, and added the additional focus of material/labor management, which winds up, I think, watering down the what I felt should be the focal point of the game...the cubes themselves. So now, you just pretty much "collect cubes" from a small sample of cubes. This is something that often gets talked about in various designing themes, such as removing "fiddliness" if possible, or "streamlining" rules. But often enough, this is almost based SOLELY on making the game work better, not making it more fun. (However, this should indirectly make things more fun in theory, as streamlining things should make the game more playable.) But very rarely are the discussions held in in terms of "what parts of the game make the game fun, and how do you bring that more in focus." It's a question that should be asked more often in the design circles I follow. And I probably should ask it to myself more often as well. Build a Magic Mirror for Halloween.